Four subdistricts in Putuo are expected to become Shanghai's first batch of communities without illegal structures after a major crackdown. 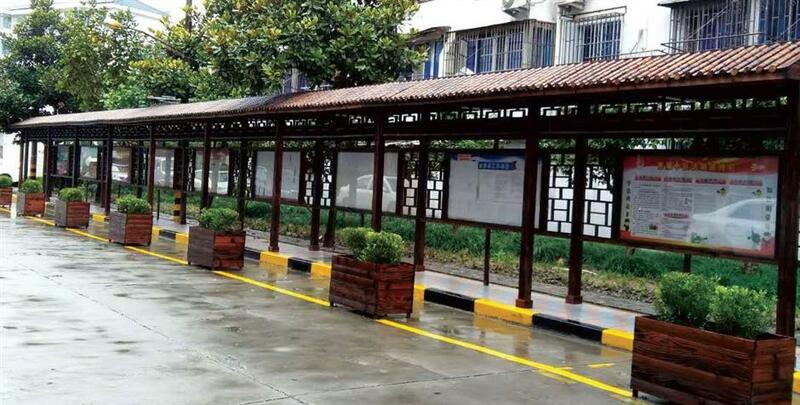 Before and after (above) of the newspaper reading area in the Xiangquanyuan community in Putuo’s Wanli Subdistrict where public spaces have been renovated with illegal structures torn down and illegal parking moved away. Four subdistricts in Putuo are expected to become Shanghai’s first batch of communities without illegal structures after a major crackdown. The Caoyang Community, Shiquan Road, Zhenru and Wanli subdistricts have been inspected by city authorities to check their progress in the campaign against illegal structures. An inspection team led by city officials late last month visited the Xiangquanyuan Neighborhood on Xiangquan Road, where illegal buildings were once rampant. Xiangquanyuan falls under the jurisdiction of Wanli subdistrict and confirmed the efforts of the district and subdistrict governments had paid off. The neighborhood, built in the early 1990s, once had many illegal structures, mostly built by residents to expand their limited living space, said Jiang Renda, 69, a senior resident in the neighborhood. “Residents once piled up stuff or parked bicycles on stairways to occupy public area and disputes often happened among neighbors,” Jiang said. The Wanli subdistrict launched the campaign in June 2016 to ask resident to demolish the illegal structures and remove belongings from public areas. Officials from the subdistrict and neighborhood committee persuaded those who opposed the program by helping them solve various difficulties, said Hu Yufeng, the Party secretary of the Xiangquan neighborhood committee. Subdistrict officials helped find new accommodation for an 80-year-old resident surnamed Lai, who lived alone in a jerry-built house in the neighborhood. Officials accompanied Lai to visit family members in China’s east Jiangxi Province during the Spring Festival. A mobile laundry rack has been installed for residents who complained they had no place to hang and dry clothes in the neighborhood. Officials tore down three walls to add parking space for residents who could hardly find a vacant parking lot before. “We previously preferred to stay at home due to the poor environment in the community, but now senior neighbors come out to do exercises in the renovated garden and chat with each other,” Jiang said. During the campaign, the Wanli Subdistrict demolished more than 55,000 square meters of illegal building in 224 places, along with 72 unlicensed businesses and over 150 underground sites with safety risks. Some residents in Xiangquanyuan composed a poem of gratitude for the government’s efforts while reminding their neighbors to maintain the new environment. In Putuo, the district government has torn down a total of 828,600 square meters of illegal structures in about 6,000 places. To further improve the living conditions of the residents, the Putuo government has appointed 11 architects to conduct bespoke planning for its 10 subdistricts and towns. A series of redevelopments have also been carried out for the old neighborhoods, along with the demolition of the illegal structures. Many of the illegal structures have been replaced by parks, community gardens, rooftop gardens, jogging tracks and exercise areas with the help of the architects, according to the district government.